With the stroke of a pen Wednesday morning, Gov. 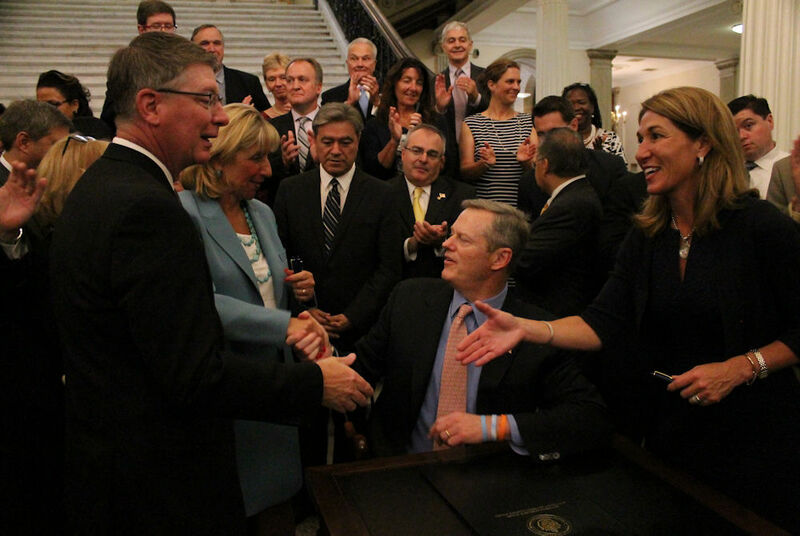 Charlie Baker authorized $500 million in new state infrastructure spending, $45 million for contaminated site cleanups, and $4.5 million for a cybersecurity and data center. The roughly $1 billion economic development law completes the work on major bills highlighted by the governor as priorities for this legislative session. Five of six items identified by Baker as must-finish policy pieces became law in recent weeks, although Senate President Stan Rosenberg said last week that in the rush to write those bills lawmakers lost an opportunity make “good bills” even better. Baker administration economic development officials were not able to assign an estimate of the number of jobs that would be created with the bill’s implementation, but said the legislation strengthens the foundation for private sector employers to grow in Massachusetts. The new law features tax credits to promote investments in new companies, creates a commission to examine online gaming in Massachusetts, and encourages workforce development by extending to families a new tax deduction tied to college savings plans. The bill also authorizes $107.5 million for a new berth and cranes at South Boston’s Conley Terminal, which handles shipping containers for the Port of Boston. The governor vetoed a provision of the bill allowing for community benefit districts, where a group of property owners can get together and agree to assessments for improvements – similar to a business district. Baker told reporters there are “too many unanswered questions about how it would work,” and said it would apply to entities traditionally exempt from the full cost of property taxes. His veto letter says the provision does not require that a majority of the affected property owners support creation of the district. According to a bill summary, cities and property owners could create community benefits districts to fund services in downtown areas, with signatures from property owners representing at least 50 percent of the assessed value in the district. All property owners in the district would contribute based on a fee structure. In his veto letter, Baker said non-profits, houses of worship and government entities would be required to pay into benefit districts and the proposal didn’t protect residential property owners entitled to tax abatements, such as blind, elderly and veteran residents. After a midnight scramble July 31 to enact legislation regulating ride-hailing apps, fostering renewable energy growth and stimulating the Bay State economy, lawmakers left unfinished a bill that would have limited non-competition agreements in employment contracts. Lawmakers made the jobs bill vulnerable to Baker’s veto by sending it to the governor as formal sessions came to a close until January. Veto overrides require a recorded vote, which can only take place during formal sessions. While some laws are tailored to deal with one particular issue, jobs bills are usually a hodge-podge of priorities for state assistance to the economy, chock full of programs that lawmakers can tout in their bids for re-election. The $500 million MassWorks financing will be available for economic development projects in need of public funding of infrastructure. Another $45 million would fund equipment and capital improvements at career and technical education training programs. The state’s brownfields redevelopment fund, which is occasionally tapped dry by cleanup projects, will receive a $45 million influx of authorized capital spending. At a bill-signing ceremony at the bottom of the Grand Staircase, Gardner Mayor Mark Hawke talked about how a $200,000 MassWorks investment paved the way for an expansion of New England Peptide’s facility. Hawke said a sewer main lay in the way of the expansion, and MassWorks funding altered the street and realigned the main. The expansion created 12,500 square feet of new workspace, according to the company, which in 2015 said it plans to hire three to five people per year for the next five years. “Is there anyone here who isn’t looking for a grant?” Housing and Economic Development Secretary Jay Ash half-joked at the start of the bill-signing ceremony. In addition to authorizing borrowing and spending roughly $1 billion in capital dollars, the new law establishes a new tax incentive for a prepaid tuition or college savings program established by the state. Single filers will be able to deduct $1,000 while married people filing jointly can deduct up to $2,000. The bill also establishes an “angel investor tax credit” to encourage early investment in new companies. Investors would be able to receive an income tax credit of 20 percent of their investment in qualifying Massachusetts businesses that have no more than 20 fulltime employees and $500,000 in revenues. For fledgling businesses located in the state’s 26 “gateway cities” – cities where educational attainment and median income are below the state’s average – the credit totals 30 percent of the investment. The program will be subject to a $30 million annual cap and it authorizes the state to “claw back” tax credits if the company fails to comply, according to a bill summary. The Baker administration had sought authority to award up to $50 million in tax incentives under what it called an “extraordinary economic development opportunities” program. The bill also permits the sale of alcohol by liquor stores on Memorial Day, after noon, and allows certain grocery stores to include on-premises alcohol consumption areas. Baker specifically noted the bill will allow the Nashoba Valley Winery to continue its operations, holding a farmer’s brewing license and a license to serve its products at a restaurant on the property. State liquor regulators in March told the business it could not both pour and produce alcoholic beverages on its property. Lawmakers who negotiated the compromise version of bills passed by the House and Senate did not include a Senate provision that would have given municipalities control over the number of liquor licenses for local bars and restaurants. When municipalities run up against the statutory cap, they must appeal to the Legislature for special laws authorizing them access to additional liquor licenses. Boston is home to the online fantasy sports company DraftKings, which received some consideration in the new law. The legislation allows fantasy contest operators to offer their contests in Massachusetts, as regulated by the attorney general, until July 31, 2018, according to a bill summary, and it creates a commission to study the matter.